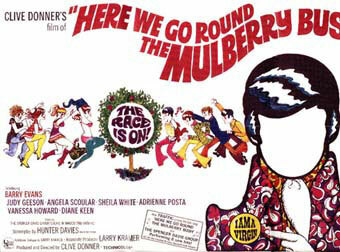 Not often seen – and certainly not on the big screen – 1967’s Here We Go Round The Mulberry Bush gets a showing at NFT 1 at the BFI South Bank in London on Friday 21st September, kicking off at 6:15 pm. It’s the latest Flipside presentation, under the heading Psych Sunsplash ’67. And as well as seeing forgotten teen star Barry Evans swinging to a Spencer Davis Group/Traffic soundtrack, you also get two other 60s rarities to entertain you. A Valentine For Tony Blackburn and Barry Evans is just that – the two men receiving cards from adoring fans in 1968. While In Gear (Look At Life) from 1967 is a trip round the era’s grooviest boutiques. Add to that a Q&A with Hunter Davies (novelist and screenwriter of Mulberry Bush) and the night looks like a winner. See the BFI website for ticket details and pricing. Speaking of retro…you will love the music on luxuriamusic.com. do check it out.